Russell & Ballard offers a variety of services and also the personalized customer service that you won’t receive in one of the big mall stores. Whether it’s an engagement ring or a watch battery, we are here to help you with all your jewelry needs. 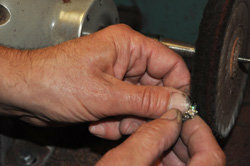 Russell & Ballard provides a wide spectrum of services to meet all your jewelry wants and needs. When a piece of your jewelry breaks, Russell & Ballard cares that it gets fixed right. Russell & Ballard has one of the leading Goldsmiths link to Meet Our Experts/Goldsmith in West Michigan who fixes your jewelry on site, so that it never leaves the store. Bring your piece to our store and we will restore your jewelry to “like-new” quality and make sure that you are 100% satisfied with the repair. Your jewelry will be fixed in approximately one week for your convenience and will be ready after 5:00 on the scheduled pick up date. Contact us to get a quote for your repairs. Many watch repairs, including batteries and links, can conveniently be done at the store while you wait. We send out all broken or non-working watches to a local repair shop, and you can expect your repair in approximately 1-3 weeks. Let your creative side shine by letting us help you design the perfect piece of jewelry for that special someone. We take inspirations from photos, drawings, and images. You will get to see your jewelry in all the stages from a computer drawing (blue print) to a wax mold and then the finished product. This process takes about 6-8 weeks and can be very affordable. We can work with any budget. Prices may vary for these services. Contact Us for a free estimate. Appraisals can be done for you and/or your insurance company by one of the two owners. The appraisals includes two copies, one for your records and one for your insurance company. Appraisals generally take one week. Ring Engraving is usually done in our store for no charge if the ring is purchased from us. If not we would be happy to engrave rings or any other item for a per letter charge. Stop in to see the many scripts and sizes. Are you considering selling your old jewelry or other platinum, gold, silver or diamonds? If you are, we are here to help. Russell and Ballard Jewelers provides this free services, for our customers, and are experts at evaluating your fine, antique and sterling silver jewelry, diamonds, silver flatware and coins. We even purchase jewelry if it is broken or damaged. Consult us about your unwanted or damaged items, and let us offer you some alternatives, in a safe and friendly environment. Why let unwanted, damaged or boring pieces of jewelry take up space in your jewelry box when you can trade them in for cash or for a new piece of jewelry or custom design a new piece! IF YOU USE YOUR TRADE IN AMOUNT TOWARDS A NEW PIECE OF JEWELRY YOU WILL RECEIVE AN ADDITIONAL 20%! Let us clean and buff your ring while you look around our store. Ring sizing can be tricky, but our expert team can size your finger, give you suggestions and get your ring fitting perfectly. Your ring will be ready for you in about a week and come back buffed and cleaned.